Your pot belly, beer belly, spare tire—whatever you choose to call it—is not something to take lightly. Your waist circumference measurement is a very important number to know when you have type 2 diabetes or are at risk for developing it. Control your waist circumference, and your risk for diabetes and other diseases and conditions will decrease. Studies have shown that your waist measurement might be as important as the body mass index (BMI) in predicting disease risk and overall health status. Even underweight people with a large waist circumference have been found to have a high risk for developing type 2 diabetes—just the same as people who are overweight and have a higher BMI. The BMI is a ratio of weight to height and can indicate obesity, but it does not provide a clear picture of how body fat is distributed on the body. However, the waist circumference measurement can more accurately identify if body fat is stored in the high-risk intra-abdominal region. 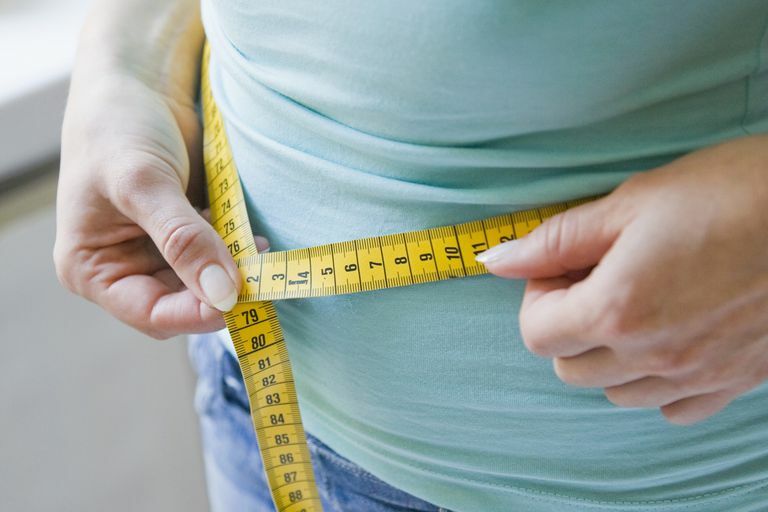 What Causes a High Waist Circumference? A high waist circumference is due to abdominal fat. A protruding belly is often caused by intra-abdominal visceral fat. Visceral fat is fat that develops between and around internal organs. This type of fat is different than "regular" fat that sits just beneath the skin and can be pinched. This type of fat is deep within the abdomen and is considered very high risk. Fat cells were once thought to be solely for energy storage. However, it is now known that they also secrete hormones. They play a part in response to infection, inflammation, and injury, among other things. They also secrete both inflammatory and anti-inflammatory substances. Inflammation may be a component or cause of diabetes. Of special interest to people concerned with diabetes, fat cells secrete adiponectin, a protein hormone, which improves insulin sensitivity and lowers risk for atherosclerosis and diabetes. However, less adiponectin is produced as fat cells increase. If you are stressed physically, mentally, or emotionally, you may have high levels of the stress hormone cortisol. Chronically elevated levels cause your body to deposit more visceral fat in the abdomen. Waist Measurement Recommendations - What Should My Waist Measure? The current recommendation from the American Heart Association is for waist circumference to be evaluated in people with a BMI of 25 or higher. However, at least one study has revealed that the risk for developing diabetes was stronger for people who had a lower BMI but had a high waist circumference. A BMI below 18.5 is considered underweight, between 18.5 – 24.9 is optimal, between 25 – 29.9 is overweight and over 30 is obese. Here is a BMI chart to find your BMI. It is recommended that men have a waist circumference of 40 inches or less and women have a waist circumference of 35 or less. Metabolic syndrome is a group of medical conditions that occur together and increase risk for diabetes, heart disease, and stroke. Abdominal or central obesity along with insulin resistance are considered the most important risk factors. Stand straight and try to relax. Exhale normally. Locate your hip bones and wrap the tape measure around your body just above them. A good spot to aim for is halfway between your hip bone and the lowest rib. Make sure the tape measure is flat against your body and parallel to the floor. The tape measure should be snug against your skin but not overly tight. This spot should be approximately at the same level as your bellybutton, but can vary in some individuals. If not, do not move the tape measure to cover the belly button. If you have type 2 diabetes, metformin and thiazolidinedione medications may provide benefits over other diabetes treatments in helping to reduce waist circumference. Body Composition Tests. American Heart Association. Healthy Weight Loss. American Diabetes Association. Weight and Waist Measurement: Tools for Adults. Weight-Control Information Network.